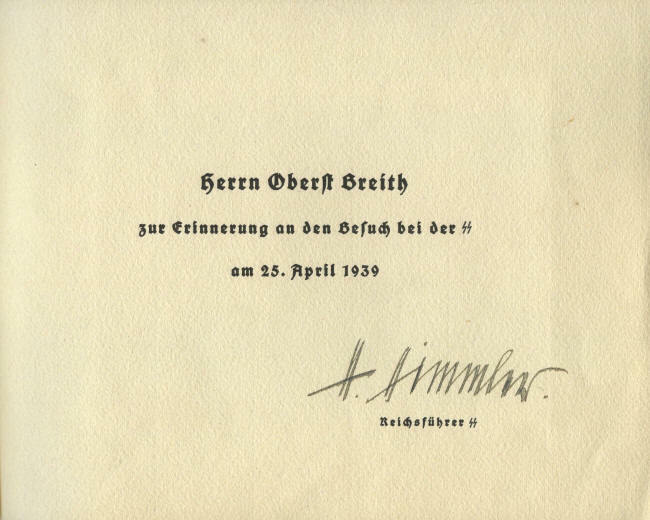 Heinrich Himmler, 1900-1945. Nazi Reichsführer-SS; Chief of the German Police; Minister of Interior, 1943-1945. 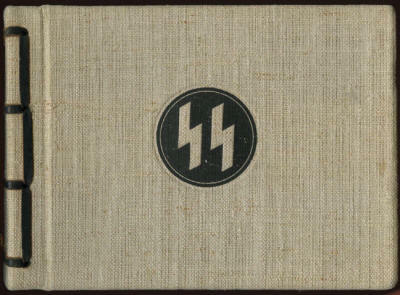 Extraordinarily rare and important SS presentation photo album, with great association, signed H. Himmler. This 6" x 8" album, which is in near-mint condition, commemorates the visit of high-ranking German military officers and civilians to the SS concentration camp at Dachau, Germany on April 25, 1939. The visitors were obviously important to Himmler, since he directed the preparation of presentation photo albums such as this. This is one of only nine, with identical photographs, that are known to exist. Our research has disclosed no similar albums made to commemorate other such occasions. This album directly and emphatically ties Himmler to the Dachau concentration camp. 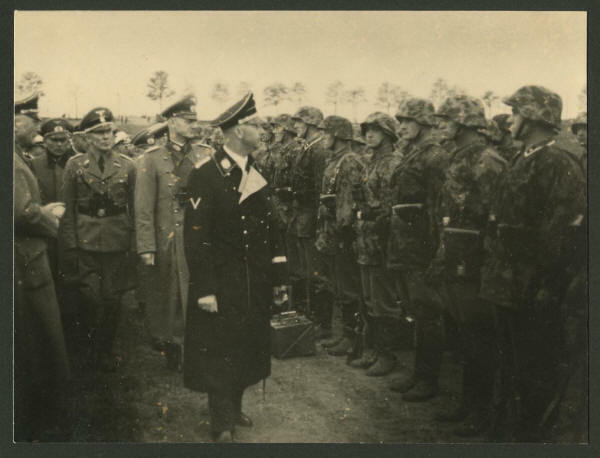 It contains a series of 12 photographs of Himmler and others taken by Friedrich Franz Bauer, who was Himmler's personal photographer, depicting scenes in and around the camp. 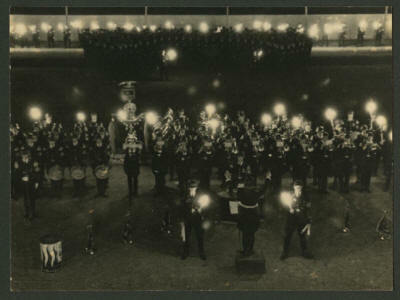 Some of the photographs are shown here.  Bauer's name and address appear inside the back cover of the album. 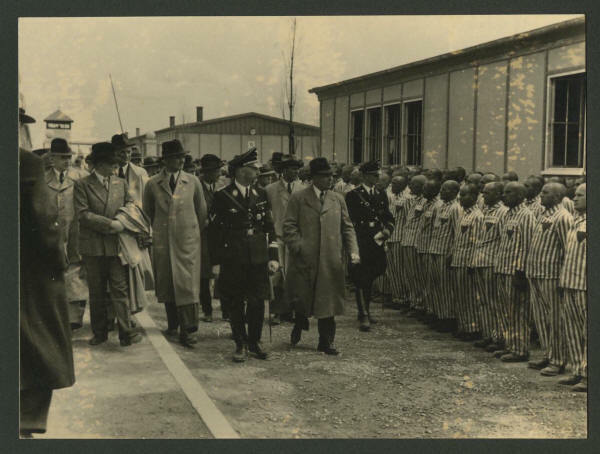 Dachau, outside of Munich, was one of the first concentration camps used to intern political prisioners. 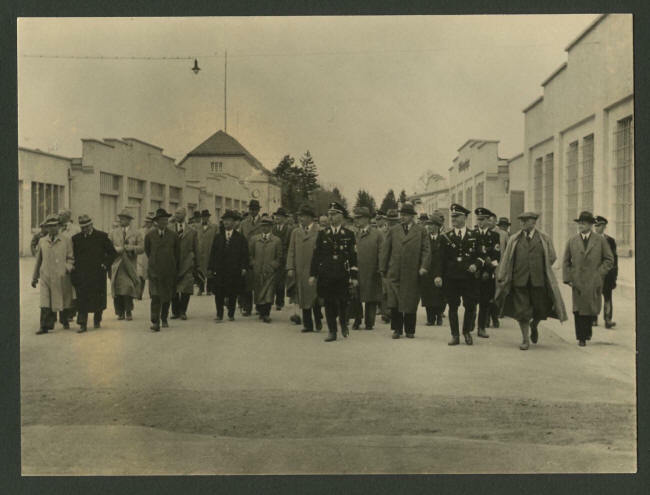 At this point, in early 1939, the prisoners were political prisoners, not necessarily Jews, and Dachau was a work camp rather than the extermination camp that it later became. 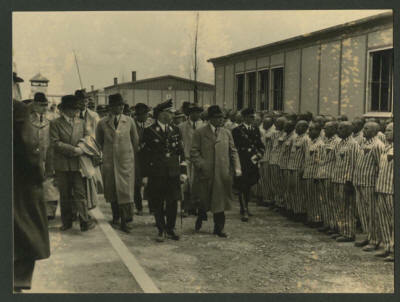 A chilling photograph in this album shows Himmler and others inspecting a group of prisoners, with shaved heads, standing at attention. That photograph, together with all of the others in the album, is shown below. Reportedly that photograph also pictures Oskar Schindler (1908-1974), a German industralist and opportunist who ultimately spent his fortune bribing Nazi officials in order to keep some 1,300 Jews alive. Schindler appears to be the tall man in the light colored trench coat just behind and to the left of Himmler as one views the photograph. He was featured in the 1993 Stephen Spielberg film Schindler's List. Other photographs in this album show work at the porcelain factory at Allach, near Dachau, where porcelain was produced under direct control of the SS, much of it for presentation by Himmler; military field exercises; inspection of troops by Himmler; a banquet in honor of Generalmajor Friedrich Bayer and other visitors; a meal with Theodor Eicke, the commandant of Dachau; and a nighttime concert by an SS band. 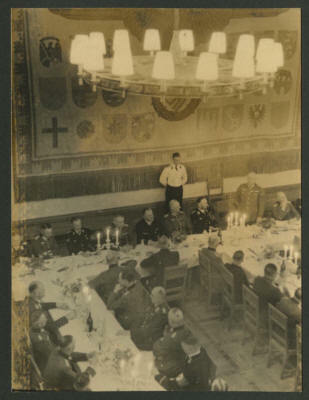 Among Breith's decorations was the coveted Ritterkreutz des Eisernen Kreutzes mit Eichenlaub und Schwertern—the Knight's Cross of the Iron Cross with Oakleaves and Swords. The Knight's Cross of the Iron Cross recognized extreme battlefield bravery or successful leadership. It had five degrees, of which the Knight's Cross with Oak Leaves and Swords was third. Of the 7,313 awards of the Knight's Cross, only 160 were with Oak Leaves and Swords. Breith's was number 48. This photo album is exceptional. It is wrapped in off-white linen, embossed with the SS runes, and is bound with leather ties. 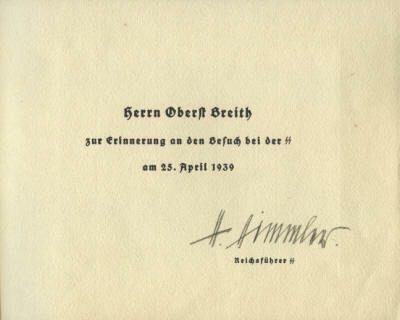 Himmler has signed it with a beautiful 2¾" signature.